For seasoned wine lovers, a restaurant’s wine list is at least as important as the menu itself. Unfortunately this is also what many restaurant reviews just glance over, adhering to the philosophy that the food needs to be top notch – and the wine shouldn’t disappoint. So I’m happy to turn the tables on that: in this series of articles, I am looking for restaurants with fun, diverse, exciting, impressive or surprising wine lists, in a nice setting and where, of course, good food is served as well. Inès Vankeirsbilck and David Grosdent are young, but no rookies in the hospitality business. David used to work at chef Wout Bru’s restaurant in the French Provence, and in the Belgian 2-Michelin-star restaurants Sea Grill in Brussels, under the direction of Yves Mattagne, and Le Château du Mylord in Ellezelles. 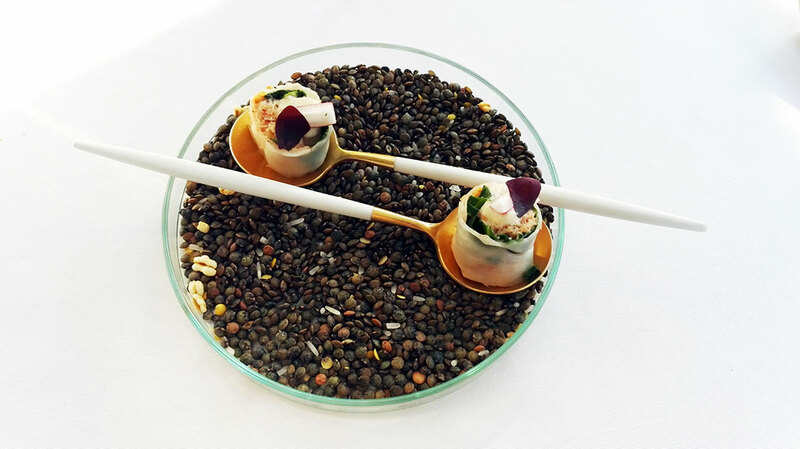 Inès in turn studied at the renowned hotel and catering school Ter Duinen in Koksijde and started her career as a pastry chef in several Michelin-starred restaurants, including Sea Grill and Le Château du Mylord. Furthermore, she is passionate about wine and continues to explore the wonders of food and wine pairing. Both of them love gastronomy with honest, delicious and local ingredients, as well as wines with a soul and a good story. Stories that are told fluently in several languages, by the way. 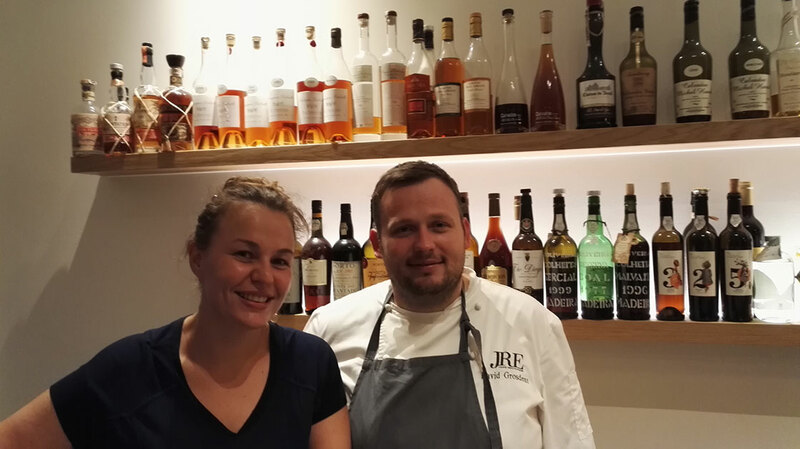 During our visit to L’Envie, about 15 kilometres southeast of Kortrijk, we were surrounded by tables where all sorts of French, English and Flemish were spoken, and Inès and her team effortlessly adapted. 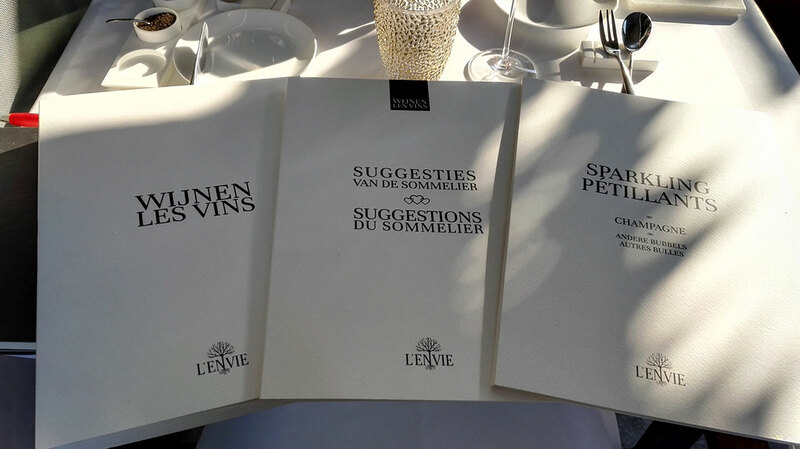 The wine list itself is drafted in French and Dutch. But really I should say ‘wine lists’, because at L’Envie you get no less than 3 lists to choose from: the full wine list (more than half an inch of solid reading for the real aficionado); a reduced wine list with the sommelier’s suggestions; and a separate list for champagnes and other sparkling wines. 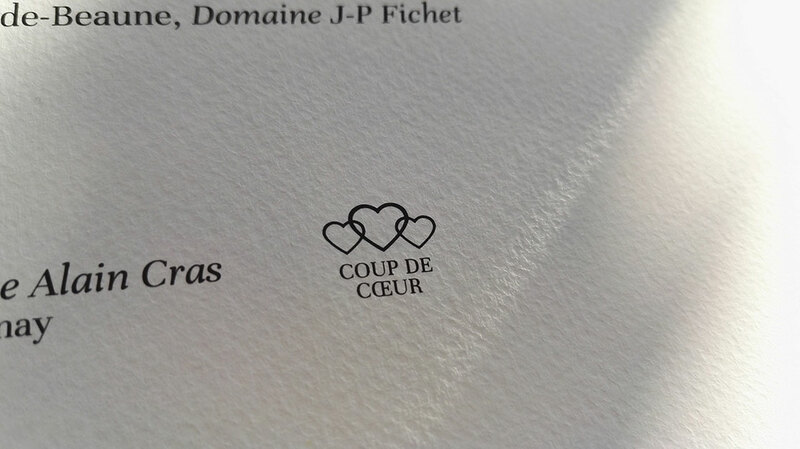 In each list, a number of wines are marked as ‘coup de coeur’, which makes them more accessible for guests who like wine, but don’t necessarily wish to devote their lives to the study of it. I of course immediately went for the sparkling wine list, and it really impressed me with a remarkable offer of champagnes, consisting of a diverse mix of big names and lesser-known, excellent producers. Admit it: a list where you find Françoise Bedel’s biodynamic champagnes side by side with Roses de Jeanne, Jacques Selosse and Pol Roger, including several extra brut champagnes, such as a 100% Pinot Meunier by Francis Boulard et Fille, and a blanc de blancs by Ulysse Collin, does cater for happy moments. We counted a total of 92 champagnes on the list, all fairly and competitively priced, ranging from €39 to a heftier €670 for the Salon Cuvée S blanc de blancs. When it comes to wine countries, L’Envie’s wine list is on the classic side, dominated by France. They also offer a reduced but often creative selection from Italy, Austria, Germany, Spain, Croatia, Portugal, Chili, Australia, South Africa, Argentina and New Zealand. Within France, the choice is almost limitless, with besides Bordeaux, Burgundy and Rhône wines, a lot of attention for gems from Alsace, Jura, the Loire Valley, Languedoc-Roussillon, Sud-Ouest, Provence and definitely Corsica. I noticed several good-value and well-selected Alsace Pinot Noirs on the list, a few fun and food-friendly Beaujolais wines, and even a Jurançon Sec. All good things in my book. In still white wines, the wine list counts just under 250 references, ranging in price from €32 to €950 a bottle. Around 280 still red wines are listed, valued between €26 and €1090. During a first visit to a restaurant, I often order the matching wine package with the menu. I find it an ideal way to learn about a sommelier or restaurateur’s style and focus – and it tends to show if they are inclined to cut corners when it comes to price-quality ratio. The latter is certainly not the case here. We started with a good-quality champagne, accompanied by refreshing, sunny appetisers, and each of the consecutive matching wines paired well with its dish. On top of that, L’Envie’s wine packages are fairly and reasonably priced. I applaud that Inès has the courage to serve some of the fruitier red wines lightly chilled, contrary to what’s customary in many restaurants and households in Belgium, where we tend to drink our red wines on the warmer side, which doesn’t always shows them at their best. She poured us a cool juicy, fruity natural wine from Bergerac in the French Southwest, which showed spicy-herbaceous and delicately meaty flavours with just a whiff of funk, to go with our main of duck breast with broad beans, shallot and a croquette of duck leg. A truly delicious combination! 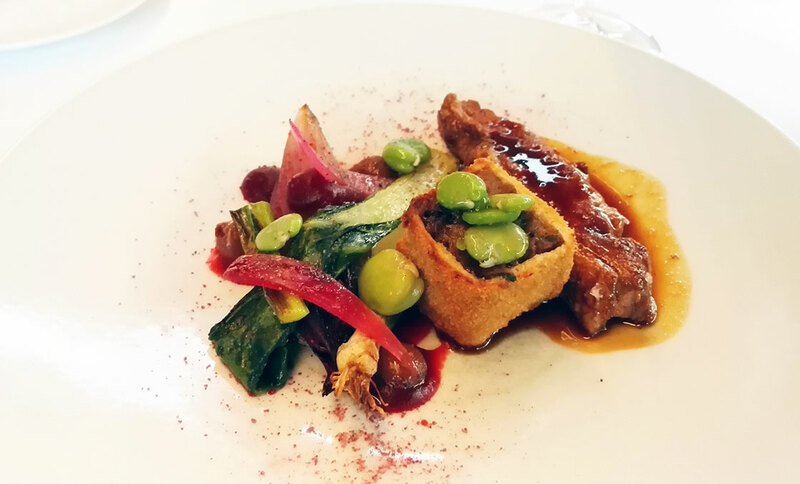 At Restaurant L’Envie you find authentic, flavoursome and gastronomic food, prepared with fresh, local produce and presented in an elegant yet relaxed setting, where as a guest you feel truly welcome. And the wine list is definitely worth a detour to the village of Sint-Denijs. Recommended for Dionysos’ most devoted disciples as well as for everyone who loves good food to go with a delicious glass of wine.